A holiday party isn’t a party without festive looking sweets. Shake up your dessert table this holiday season with these no-bake Peanut Butter Rice Krispies Treats. Super simple to make with only 5 ingredients! This post has been sponsored by Mars Wrigley Confectionery, US, LLC PillsburyTM, & © 2017 Kellogg NA Co. All thoughts and opinions are my own. If you need an easy holiday dessert, this recipe is perfect for you! These Peanut Butter Rice Krispies® Treats are ridiculously easy to put together and they don’t require any baking skills. The only difficult thing about them is to wait when they are chilling in the refrigerator. I came up with the idea of this recipe when I went to Target at the weekend. It’s always fun to go there during the holiday season. My plan was to buy a package of Kellogg’s Rice Krispies for our busy morning breakfast, but then M&M’S® Peanut Butter Brrr-ittle candies called my name when I was passing by the candies aisle. You can find these only at Target, so I bought a few packages for our holiday preparations. I LOVE them! You have to taste these guys! Besides their yummy taste, they make any treat look more attractive. That’s what we are looking for at this time of year, right? So I decided to make a fun twist on the classic krispies treat with some chopped M&M’S Peanut Butter Brrr-ittle candies. They turned out pretty awesome. 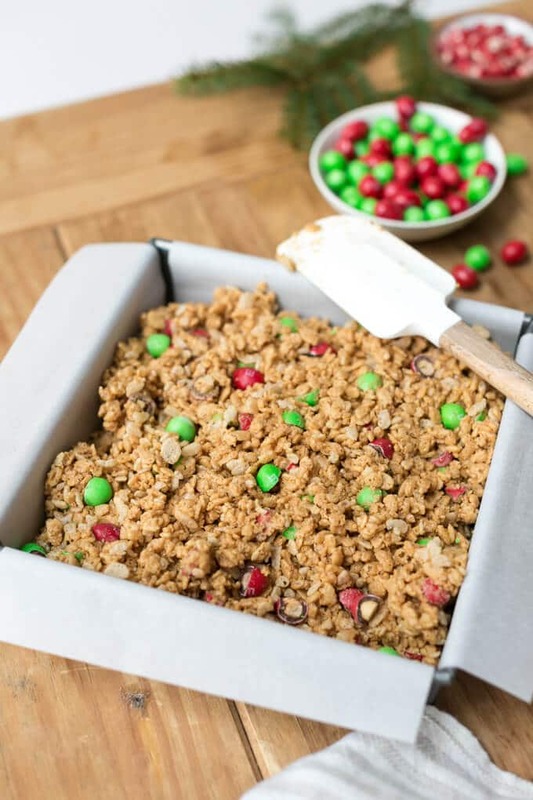 To make an easy, tasty and festive holiday treat is not that hard if you have the right ingredients. For this recipe, I used only 5 ingredients: M&M’S Peanut Butter Brrr-ittle candies, Kellogg’s Rice Krispies, honey, peanut butter and PillsburyTM Filled Pastry Bag Chocolate Fudge Flavored Frosting. I simply combined all the ingredients except the frosting and spread this mixture in a pan. To make the mixture hold well, I pressed it into the pan evenly using a spatula and then let it sit in the refrigerator overnight so that you can slice it in squares afterwards. Personally, I think a holiday dessert always needs some chocolate. Let me introduce you a fantastic product to help you make your dessert even more attractive. Have you ever heard about NEW Pillsbury™ Filled Pastry Bag Chocolate Fudge Flavored Frosting? It’s available at Target now and they have a 25% Pillsbury pastry bags Cartwheel offer through 12/24/2017 on the Target app. If you are a fan of chocolate frosting on your treats, you have to get it. Frosting couldn’t get any easier than this! You won’t want to make your own frosting from scratch once you use it. I felt like a pro when piping the chocolate fudge over these Peanut Butter Rice Krispies Treats thanks to this pre-filled pastry bag. It is super easy and fun to make decorations on your cakes, cupcakes, cookies or bars using its built-in star tip. As I love the flavor combination of peanut butter and chocolate, I thought the best frosting on these Peanut Butter Rice Krispies Treats would be chocolate fudge. But there are other options of the new Pillsbury™ filled pastry bags you may want to use, like vanilla or cream cheese. Imagine these beauties on your dessert table at your holiday party. Wouldn’t it be so cool? Nobody can guess it’s super easy to make these unless they are told so. BTW there is also a Rice Krispies Cartwheel offer at Target and I think you won’t want to miss it. Check out target.com for the offer! A super easy and fancy dessert recipe with 5 ingredients. In a large bowl, combine all ingredients except the frosting. Using a spatula, press the mixture evenly into the prepared pan. Slice it in squares and pipe the frosting over each slice right before serving. Making these treats takes only 5-7 minutes but we suggest chilling it overnight or at least 6 hours. This chilling time is not included in the Prep Time. I was surprised to see that there was no marshmallows included in this recipe. I decided to give it a try because it was unique and these were FANTASTIC!!!! I will be making these for my families Christmas party! Thank you so much for the post! What a great idea for the holidays. They look so cute (and yummy). I’m going to make these as soon as I get the ingredients and I know my kids are going to love them. Thank you Edwina! These are really easy to make. Just don’t forget to chill them. Hope your kids love these as much as we did.